A look at the causes of muscle weakness as well as Janda’s classification of muscle imbalance patterns. Muscle length testing involves elongating the muscle in the direction opposite of its action while assessing its resistance to passive lengthening. Treatment of muscle weakness aims at stimulating and increasing the response of the muscle spindle of the pseudoparetic muscle. Rehabilitation rather than surgery is recommended for secondary impingement. Assessment and Treatment of Muscle Imbalance: The Janda Approach blends postural techniques, neurology, and functional capabilities in order to alleviate chronic musculoskeletal pain and promote greater functionality. Assessment and Treatment of Muscle Imbalance: The Janda Approach blends postural techniques, neurology, and functional capabilities in order to alleviate chronic musculoskeletal pain and promote greater functionality. Developed by Vladimir Janda, respected neurologist and physiotherapist, the Janda approach presents a unique perspective to rehabilitation. In contrast to a more traditional structural view, the Janda approach is functional—emphasizing the importance of the sensorimotor system in controlling movement and chronic musculoskeletal pain syndromes from sports and general activities. 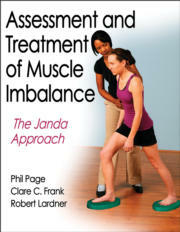 Assessment and Treatment of Muscle Imbalance: The Janda Approach is the only text to offer practical, evidence-based application of Janda’s theories. Assessment and Treatment of Muscle Imbalance provides an evidence-based explanation of muscle imbalance. The step-by-step Janda system of evaluation is explained—including analysis of posture, balance, and gait; evaluation of movement patterns; testing of muscle length; and assessment of the soft tissue. The text explores treatment options for muscle imbalance through facilitation and inhibition techniques and sensorimotor training to restore neuromuscular function. It also includes four case studies examining musculoskeletal conditions and showing how the Janda approach compares with other treatments. This text combines theory, evidence, and applications to assist clinicians in implementing the Janda approach into their practice. Assessment and Treatment of Muscle Imbalance: The Janda Approach focuses on the neurological aspects of muscle imbalance that are common causes of pain and dysfunction in sports and occupational activities. By distilling the scientific works of Vladimir Janda into a practical, systematic approach, this unique resource will assist health care providers in treating patients with musculoskeletal complaints as well as exercise professionals in developing appropriate exercise prescription and training programs. A reference for physical and manual therapists, athletic trainers, personal trainers, massage therapists, chiropractors, and physiatrists. A textbook for physical therapy students learning theory and application of skills for care in rehabilitation of muscle imbalance. Phil Page, MS, PT, ATC, CSCS, trained under the guidance of Dr. Vladimir Janda and has taught the Janda approach at national and international workshops. A certified kinesiotaping practitioner, Page is currently working toward his doctorate in kinesiology at Louisiana State University in Baton Rouge, where his research focuses on EMG and muscle imbalance. He is also director of clinical education and research for Thera-Band products. Page and his wife, Angela, live in Baton Rouge with their four children. In his free time, he enjoys spending time with his family, fishing, and cooking. Clare C. Frank, DPT, is an orthopedic clinical specialist in private practice in Los Angeles. She serves on the clinical faculty for Kaiser Permanente Movement Science Fellowship in Los Angeles. She also serves as a guest lecturer at the local universities and teaches throughout the United States and internationally. Frank studied under and taught with Dr. Vladimir Janda. She is a certified instructor of the Janda approach to musculoskeletal pain syndromes, a certified kinesiotaping practitioner, and a certified instructor of Kolar’s approach to dynamic neuromuscular stabilization. Frank is board certified in orthopedic physical therapy and a fellow of the American Academy of Orthopedic Manual Physical Therapy. Robert Lardner, PT, was born in Nigeria in 1961. His first career was as a professional ballet and modern dancer after studying at the Rambert Academy outside London, England. He graduated from the department of physical therapy, Lund’s University, Sweden in 1991. He studied with Professors Janda, Lewit and Kolář from the Czech Republic, who are pioneers of functional rehabilitation and manual medicine. Lardner worked in several inpatient and outpatient rehabilitation facilities in Sweden prior to moving to the United States in 1992. He was a staff physical therapist at McNeal Hospital, Clearing Industrial Clinic, and a physical therapy supervisor at Mercy Hospital. He also was in charge of physical therapy services at a number of private outpatient and sports clinics. Lardner is currently in private practice in Chicago and teaches various rehabilitation seminars throughout the United States and Europe. "This would make a useful addition to every clinician’s library—especially physical therapists, chiropractors, osteopaths, and all those using hands-on therapies." "…a thorough, well-organized, and well-written summary of the Janda approach to muscle imbalance." "With its modest price tag and practical insights of both assessment and treatment of muscle imbalance, I would recommend this book to any practitioner or student planning to treat MSK disorders." This book "provides a lot of useful information that is different from the typical treatment approaches taught in most physical therapy schools and it can only help give clinicians insights that may help them treat their patients."